In order to gain Eycott Hill a network of fields must be passed through and Birkett was meticulous on how to weave a passage through, I always tend to keep a handy alamanac edition of The Birkett Fells in my pack so just before we left I double checked todays starting point to the point where I even took a compass bearing which showed I was out by just a few degrees. I later found out that I had set off wrongly from the Bridge over Barrow Beck and not 350 yards further north, an easy mistake to make given that both routes have signage displaying public footpaths, or that's what I'm telling myself anyway. My mistake cost us 600 yards of walking 'not on the original route' and for that mistake I held my hand up! We soon joined the path at the famous Clapper Bridge over Barrow Beck from where I made sure we stuck to Birketts original route from there on in. A fine view to Souther and Bowscale Fells and the saddle of Saddleback is one. A wilderness which belies the ease of access is another. Notes: There are two places to park just outside the village. The lower arrow indicates a narrow layby where two to three cars can park on the left prior to crossing the bridge over Barrow Beck. 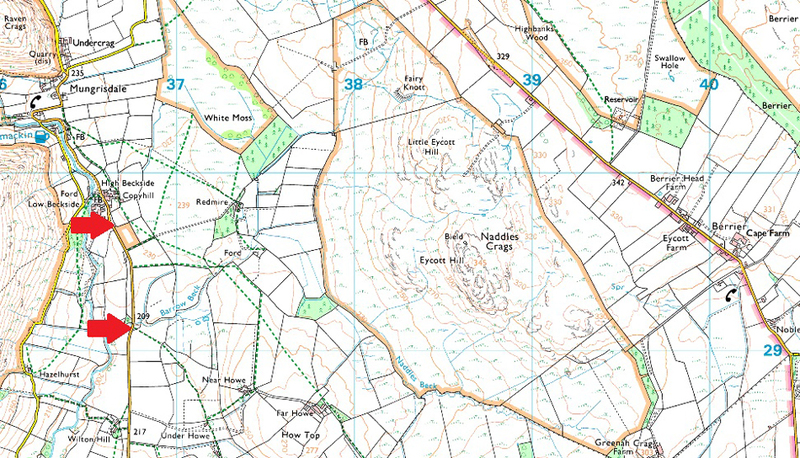 The upper arrow shows the area where a cutting can be found on the right (if travelling north towards Mungrisdale village) This cutting also accommodates up to three cars. With a strong sun yett still feeling pretty chilled in the open we decided to leave the packs in the cars and just walk with the essentials which consisted of waterproofs just incase the heavens opened and cameras housed in camera bags. This photo shows Barrow Beck between the road and the Clapper Bridge which if you squint hard enough can be seen up ahead in the centre right of the photo. Had we have taken Birketts original route we would have approached the Clapper Bridge from the field just beyond the trees on the left. The Clapper Bridge over Barrow Beck. The bridge is made up of a single stone slab 12' foot long which even has a natural arch in the centre. Birkett wrote that as far as he was aware this is the longest single span stone bridge in the Lake District. We decide that because of the early navigational error we will return by the correct route which will mean we get to cross this bridge later. Continuing along the banks of Barrow Beck. We left the bridge behind and quickly passed through a metal gate and continued towards the now ruined Westing Barn which is just up ahead concealed behind the trees over on the right. The site of what once was Westing Barn. It was time to get the book out again as we were now presented with two gates before us. Birkett recommends to pass through the little gate. This was the littlest gate we could find, joking aside we head left from Westing Barn, passed through the gate and followed the tree line along the banks of Barrow Beck until we arrived at a second gate at the far end of the field with Naddle Beck flowing just yonder. Eycott Hill (R) and Little Ecott Hill (L) soon come into view. As we head towards Naddle Beck. Looking back at some big skies with an unusual aspect of Souther Fell and The Tongue. We'd passed through the field to the left of the trees, the stone wall running from left to right shows the course of Naddle Beck which we had just crossed less the use of any bridge, well, we didn't like our boots and trousers dry anyway. On a wider scale here's Souther Fell, The Tongue, Bowscale Fell, Bannerdale and Bowscale Fell East Ridge. If this walk offers one thing it's big views. The Tongue, Bowscale Fell and Carrock Fell from Eycott Hill summit. It hadn't gone un-noticed that the skies had started to darken during those last few feet of ascent and it also didn't go un-noticed that the windchill was back but on a lesser scale, even so those impressive views more than made up for this. The view into Bannerdale as a wave of rain passes over. 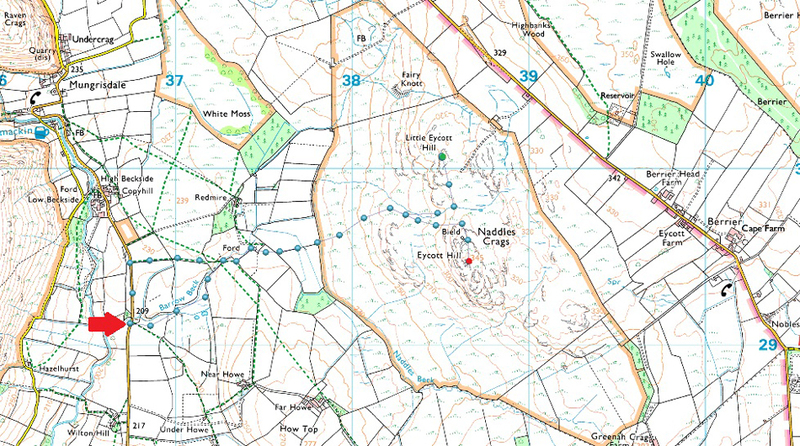 Having left Eycott Hill Birkett recommended a trip over to Little Eycott Hill which meant a return trip to the col which divides both outcrops. This was easy work but in the time it took us to reach Little Eycott Hill the skies darkened and soon we were no longer looking at the rain shower but walking through it. There might even be a hint of hail and snow too. Here comes the second wave of rain and hail. And minutes later the sun returned. Having left Little Eycott Hill clasping at hoods we descended back to the path while the showers passed over. Naddle Beck was quickly reached and we took the same line getting equally wet. We retraced our route while the skies continued to clear overhead and soon it was feeling mild again. We reached the Clapper Bridge this time making sure we crossed Barrow Beck the correct way which lead us into a field of sheep with the cars parked just as we had left them a few showers ago.